Liberal Democrat MP John Thurso describes his colourful life as a hotelier and castle-dweller and recalls a famous ancestor. 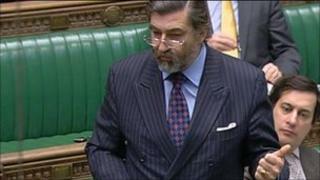 John Thurso has spent a decade as an MP, but still regards himself as "an entirely accidental politician". Living in the "ruins" of his family castle in the northernmost part of Scotland, he might appear a gentleman amateur in the careerist world of Westminster. Yet politics is in the blood of this grandson of former Liberal leader Sir Archibald Sinclair. Mr Thurso, the 57-year-old Lib Dem MP for Caithness, Sutherland and Easter Ross, was the first hereditary peer to take his seat in the Lords, vacate it and then return to Parliament as a member of the Commons. His footnote in constitutional history achieved, he has been voted in three times. "It's like moving from the Corinthian League to the Premier League," he said of his move to the Lower House. "It's a full-time job." His other full-time career was in the hospitality business, during which he managed a Paris hotel and ran the company which owned the spa group Champneys. "I've been extraordinarily lucky in that, for no discernible reason, I decided to go into the hotel business. "In the holidays I'd had jobs like washing up in a local hotel. I kind of liked the business." After leaving Eton, Mr Thurso trained at the Savoy. "I didn't want to go to university. I didn't want to go into the City, which I thought would be terribly boring, and I didn't like the idea of the armed forces at the time. "During my training I really fell in love with the business. If you don't like it, you are seriously in the wrong business." Mr Thurso spent time as reception manager at Claridge's and, still in his twenties, took over as general manager of the five-star Lancaster Hotel in Paris. "It was the most wonderful crash course in life. After that I got head-hunted away to start the Cliveden [a hotel in Berkshire]. I hired the entire team and had tremendous fun putting people together. "As a hotel, the Cliveden is what I'm proudest of. We went from a standing start and, within three years, we were Britain's best-rated hotel. "When that was coming to an end, I thought to myself: 'You are never, ever in your life going to have the chance to create from scratch something so wonderful as this, so don't try to repeat it'." Mr Thurso moved to another part of the leisure industry, running a golf course and then the firm which owned the health spa company Champneys. "Having spent my life trying to fatten 'em up, I started trying to get 'em thin," he joked. Mr Thurso grew up in the part of family home of Thurso Castle which is still habitable, following some cavalier building extensions by an ancestor and damage by a sea mine during the Second World War. He still lives "in the ruins of the family home", overlooking the Atlantic Ocean. "People talk about idyllic childhoods but they don't get more idyllic than mine", Mr Thurso said. "We used to run around barefoot all the time. We had the rocks and foreshore in front of us, and the whole farm to play with." Mr Thurso - whose full title is John Archibald Sinclair, 3rd Viscount Thurso - inherited his title in 1995. "I had never thought about the House of Lords other than when I was training at the Savoy and doing split shifts and I used to come in to shelter from the rain, which I was allowed to do as the son of a peer." In the Lords, he soon became a party spokesman, at a time when Lib Dem peers were in short supply. "People used to say that if you could talk without dribbling and manage to stand up, you were on the front bench." Then, in 1999, the Labour government removed most of the hereditary peers from the chamber, allowing only 92 to remain, to be voted in from among their own number. "There was the possibility of a hereditary election and I was thinking about that, or even the possibility of a life peerage," Mr Thurso said. "But my predecessor in Caithness, Sutherland and Easter Ross, [former Social Democratic Party leader] Bob MacLennan, got hold of me and we had lunch. "He suggested I didn't go for hereditary election and said he thought I would be a good MP. He said 'Don't tell anybody but I'm sort of thinking of standing down in 2001'. "It was one of those things I had never thought about until then. The idea of actually going home again and living at home as a constituency MP, and doing something to help the area - it was something I wanted to do. "I thought I would spend the rest of my life wondering 'what if' otherwise. The rest is history." Mr Thurso took the seat, retaining it in 2005 and 2010. "I actually think the training I had in the hospitality industry is good for the constituency work of the MP's job," he said. "I think of my constituents as my clients. "There are a couple of cases where the result of my interventions has been life-changing. That makes you really proud." Mr Thurso's grandfather, Sir Archibald Sinclair, who was the first Viscount Thurso, became Liberal leader in 1935. He had a prominent role in the wartime coalition, as Churchill's secretary of state for air. Like his grandson, Sir Archibald represented Caithness and Sutherland. "It was interesting that there were people, particularly when I was fighting the first election in 2001, who said they remembered 'voting for Archie'. He was still remembered with affection. "I knew my grandfather well and, in another way, not that well." "I really regret that, when I was becoming more aware of the world, I couldn't speak to him," said Mr Thurso. At the last election, Mr Thurso was the Lib Dem business spokesman, but did not get a ministerial post when the coalition was formed. "I was deeply relieved not to be asked to be junior or middle-ranking minister, as it would mean spending much less time in my constituency," he said. "If Nick Clegg said: 'Would you like to be secretary of state for X, Y, Z, of course I would, but there are only five Liberal Democrat cabinet ministers. "If I had the chance of running things, I would. I wouldn't want to be a minister in a department I didn't run. I suppose I've been my own boss for too long." Is this Britain's cheapest MP?